Yamaha OPL3-SA3 Audio Controller (Optional). Yamaha OPL3-ML Wavetable Synthsizer (Optional). Battery : Socketed Lithum 3V. BIOS : Intel® E28F002BXT80 2 MBit Flash EPROM. System BIOS by Phoenix. 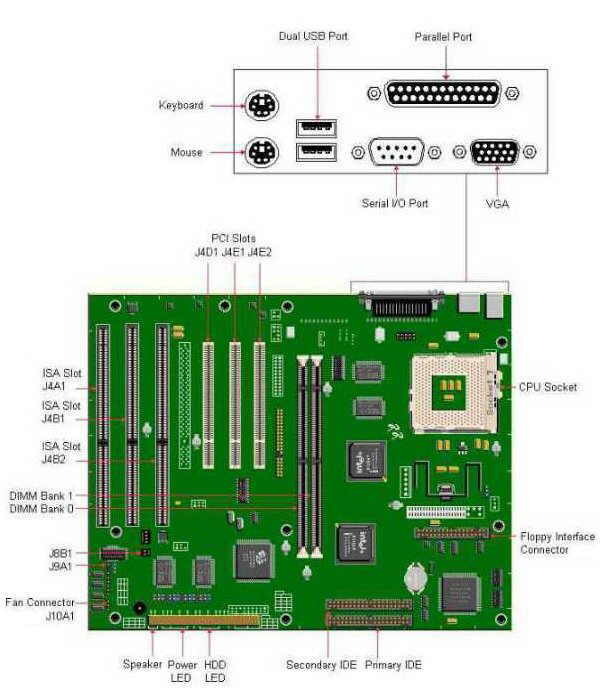 Bus : PCI/ISA based system bus. Cache : 16K level 1 cache. 256K pipeline burst SRAM level 2 cache. Chipset : Intel® 82439TX Triton System Controller (MTXC). Intel® 82371AB PCI chipset (PIIX4). CPU : Intel® Pentium Processor with MMX technology. Socket 7 supports Pentium processor from 90 MHz up to 233 MHz MMX. I/O : PC87307VUL I/O Controller. 1 DB-9 Serial port for COM2. 3 Stereo mini-jacks for Audio In, Audio Out, & Mic In (Optional). Power Supply : 200 Watts, 115V (5A) / 230v (3A) switchable. RAM : 2 168-pin DIMM sockets, upgradeable to 256MB. Uses 8/16/32/64/128 MB DIMMs, 60ns or faster. Supports only non-parity DIMM modules. Riser Card : PB790 - 3 ISA Slots, 2 PCI Slots. PB795 - 2 ISA Slots, 2 PCI Slots. PB 790 - ATI Rage II+ 3-D graphics controller. PB 795 - ATI VT3 video chipset. The RTC battery is upgraded by removing and replacing it with a Lithium 3v CR2032 or its equivalent battery in socket BT8J1. To remove the battery, locate BT8J1 battery socket on the motherboard. Use an index finger and thumb from one hand, grip the battery at opposite points. Lift the battery out of the socket. Take the upgrade battery, insure that the flat surface is facing up. Snap it into the battery socket. Note - + Positive side faces up. The motherboard comes with 256KB or 512KB Pipeline Burst L2 (External) cache. This cannot be upgraded. Intel Pentium Processor with MMX technology 166, 200 or 233 MHz. Intel Pentium Processor 90, 100, 120, 133, 150, 166 or 200 MHz (without MMX). The PB790 motherboard only accepts 168-pin DIMM modules. Only gold-plated DIMMS may be used, since the sockets on the motherboard are also gold-plated, and oxydation must be prevented. Either 3.3V EDO DRAM or unbuffered 3.3V SDRAM can be used. Both single- or double sized DIMMs may be used. EDO DIMMs may be up to 64MB big, SDRAM DIMMs up to 128 MB. The maximum total memory is 256MB, but only 64MB of this can be cached because of a limitation in the TX chipset. This means the system will actually become a little slower when more than 64MB of memory is installed. Memory type, size and speed can vary between sockets, so EDO and SDRAM can be installed on the same motherboard. Parity (x72) DIMMs can be installed, but this is not recommended, for the motherboard does not provide parity checking or ECC and parity DIMMs cause excessive capacitive loading on memory data and address lines. The on-board graphics controller includes 2 or 4 megabytes of SGRAM video memory. The video memory cannot be upgraded. Plug and Play : The Yamaha OPL3-SA3 is a Plug and Play sound system. Compatibility : Soundblaster and The Microsoft Sound System compatible. Sounds : Up to 18 simultaneous sounds. Synthesis : 2-4 operator synthesis modes. DMA : Dual DMA with FIFO for Full Duplex capability. Supports DMA demand mode. Recording/Playback : 5.5KHz to 48KHz recording/playback. Compression : Supports ADPCM compression/decompression. MPU-401 compatible MIDI and Joystick Interface. Energy Savings : Supports Power Down Mode. Mixing : Built-in 6 channel stereo mixer.